HAYATI KAFE was born in Istanbul, Turkey and moved to Sweden in 1962 where he has been living since. He started singing with the famous Carl-Henrik Norin´s band in 1964 and was a member for three years. Hayati became a celebrity in Sweden in 1968 when his cover of Bobby Darins composition “Things” made it to the top of the Swedish lists. He has recorded several LPs and CDs after that, been a frequent guest on TV-shows, toured Sweden and the Scandinavian countries as well as Great Britain, France , Germany and Holland. He has collaborated with many Big Bands in Europe, such as the Metropole Orchestra, the NDR Big Band, Rias Big Band, Soundmasters and several others. Hayati also sings often with small groups and has recorded CDs with them but also with Big Bands. 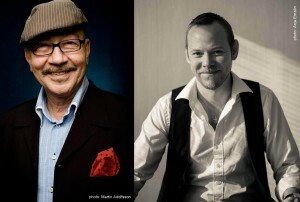 He is regarded as one of the best singers in Sweden following the tradition of Tony Bennett, Frank Sinatra and Nat “King” Cole. Recently Hayati celebrated 60 years on stage with a concert at the famous jazz venue “Fasching” in Stockholm, and will be touring Sweden in 2017. MATTIAS NILSSON is regarded as one of the most respected pianists in Sweden. Besides his devotion for the timeless traditions of jazz piano, Nilsson adds to his palette of musical colors the rich and varied traditions of Swedish folk music, hymns, native composers, and not least, his original compositions. Dreams of Belonging (2016) his first release as leader, is a solo work that features eight Swedish folk songs, hymns, more modern pieces and three original Nilsson compositions, plus a ‘classic’ John Hartford cover. The album represents the culmination of a long journey for Nilsson, and the discovery of an individual voice, combined with a deep-seated love for the music of his homeland. The album received five stars (5/5) in Ystads Allehanda (SE) and Kristianstadsbladet (SE) and is also written about in Jazzflashes (UK), DIG Jazz (SE) and SaltPeanuts (Nordic). It was followed by an international release tour in France, Sweden and the UK. Mattias has toured and performed in Sweden, Denmark, Norway, UK, Germany, Italy, France, Austria, Poland, Spain, Holland, Croatia, Turkey, Tanzania, Zanzibar, Zambia, United States and Latin America with regular visits to Chile where he also was invited by the Swedish Embassy in 2011 to play for the Swedish Prime Minister´s on his first visit to the country.